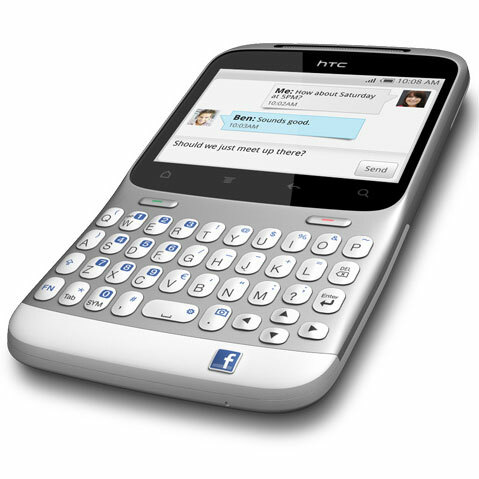 HTC ChaCha the latest offering from HTC is here and is also referred to as facebook phone by many. Well, the days of dedicated key for facebook are here. If you’re not much into social networking, then look away now, as this phone will not entice you. But those of you who can’t wait to update their status and check the wall thrice in a day, this phone is worth looking at. Apart from the dedicated facebook key and QWERTY keypad, what makes this phone tick is its Android OS. Yes, this time it’s not Windows Phone 7, but its Android. HTC, you’ve done a good job by offering Android. Let’s take a closer look at HTC ChaCha. The ChaCha is a cute looking phone and of course with a funny name. The screen size is 2.6″, yes its smaller than most other smart phones, but the resolution 480 x 320 looks perfect at this screen size. Of course I would have desired for a bigger screen size, but then we cannot forget the fact that it has full sized QWERTY keypad and hence HTC compensated for this with a smaller screen size. HTC has customized its Sense user interface to fit as much apps as possible on the home screen and some apps also have a bar on right side for further options related to that app. The home screen looks somewhat cramped if you compare this to any other 4 inch screens, but its adequate for most tasks. The HTC ChaCha lets you share music, photos, your location and status updates in just one touch via a dedicated Facebook share button. The QWERTY keyboard has balanced raised keys, perfect for speedy messages. Some punctuations gets its own key, full stop, so comma and question mark are each just one button press away. Overall, it can be said that typing is a breeze. This phone, just like other Android phones comes integrated with many Android apps. Just in case you feel the need for more apps, head over to the Android market, it has got huge selection of apps. The email icon, news app, Google Reader, Twitter, etc apps work perfectly. However, one thing is worth mentioning here that some apps don’t work with screen’s landscape orientation, so you have to turn the phone sideways. Camera is good enough for capturing images and uploading on facebook. The camera is 5 megapixel and has LED flash, along with auto focus and face recognition. The camera can capture video up to 720 x 480 resolution, this is not HD resolution but it’s atleast widescreen. Touch anywhere on the screen to force it to focus on that particular point. The camera quality cannot be said as great, but its good enough to take regular snaps. The battery life is surprisingly short. More calls and you’ll feel the need to charge it. We cannot forget the fact that it’s just 1250mAh Li-ion battery. During surfing the web, zoom in and zoom out needs to be done to read the text and that’s because of the small screen size. So coming to the important question. Is HTC ChaCha worth buying ? If you have already tried Blackberry and want to venture at something different – a social phone that let’s you stay in touch with your friends then this phone is worth trying. Those who are comparing this phone to some high end android devices like the Samsung Galaxy S2 then you are doing it wrong. This phone is just an average phone with good features but cannot be compared to high end devices. If you have seen Android on larger screens, then you will feel like you are missing something. Android looks stunning in this phone, but space is a minus point. You’ll sometimes feel like it would be great to have some more space. Also those of you who are text junkies and want to do things fast then full sized keyboard is always better than touch screen, and many of you may agree with me. Having on screen keyboard and QWERTY keyboard are different thing and that’s why may be business men’s crave for full sized keyboard more compared to onscreen. So, should you get it? If you can live with small screen, are a facebook addict and want a good QWERTY keyboard, then this is the phone you are searching for. Price of HTC ChaCha in India is Rs 15,500 (approx $ 340 USD).